Sentry 21 Loading Dock Shelter - Otco, Inc. Sentry 21 Loading Dock Shelter - Otco, Inc. The Sentry 21 loading dock shelter uses high quality, rugged construction weather tight seals that allow complete trailer access. This unit allows full access for loading and unloading truck and NO STEEL SUPPORTS NEEDED. 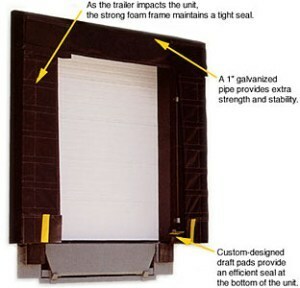 As the trailer backs in and impacts the unit the curtains wrap around the truck forming a strong tight seal. High density foam side serve as the frame, there for no steel supports needed. Removal side curtains are attached using 4” Velcro which permits easy removal and replacement of curtains when needed. Head curtain attached 4” above side pads creating a 4” tapped roof. OTCO uses a strong 1 ½” pipe providing extra strength and stability. Custom designed draft pads provide an efficient seal at the bottom of the unit. Sides are made using select treated wood backer using HIGH DENSITY FOAM covered using 22 oz. UV rated vinyl. Curtains are constructed using high tear high abrasion 40oz. UV rated vinyl. Standard angled brackets supplied for mounting seal to building.